February 6, 2013 / Sunnyside / Food in Sunnyside / Queens Buzz. 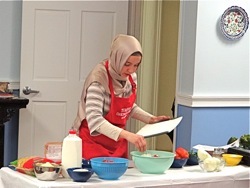 I attended an evening cooking class offered by the Turkish Cultural Center in Queens. 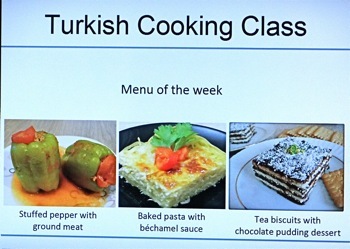 They offer one cooking class each month, wherein they teach Turkish cuisine. 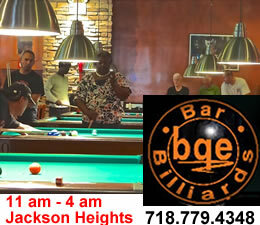 Seating is limited to about fifteen; and you don’t have to be a member or Turkish to attend. In fact almost all of the people in attendance were not Turkish, and there were a couple of males in attendance too. My interest in Turkish cuisine has grown over the past few years, as Sunnyside and western Queens has become a small magnet for Turkish immigrants. Turks have a long history of culinary achievement and a number of them have opened grocery stores and restaurants which have become quite popular in their neighborhoods [see review of the Turkish Grill restaurant in Sunnyside]. 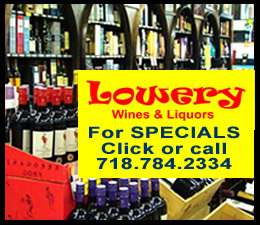 Click here to read our report and view our photo slide show of Turkish cooking classes in Sunnyside Queens. February 6, 2013 / Sunnyside / Food in Sunnyside / Queens Buzz. Continued. 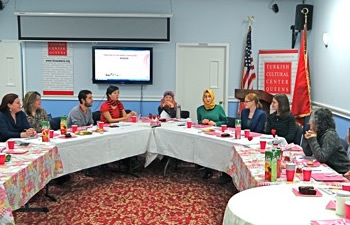 I had attended other events hosted by the Turkish Cultural Center in Sunnyside, and was invariably served Turkish food prepared by the female members of the Turkish Cultural Center, so I had some notion of what to expect. 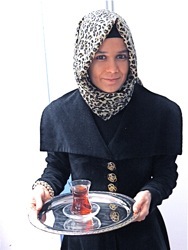 When I arrived one of the female hosts, dressed in traditional Turkish clothing, was serving tea in uniquely curved, glass tea cups. I sipped the tea without adding any sugar or milk, and so it had a small bite to it, but well within the range of my tastes, and it evoked memories of travels abroad. 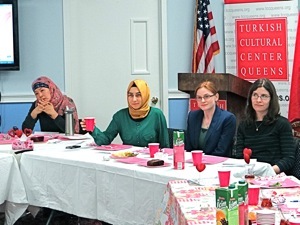 In the photo to your left is a member of the Turkish Cultural Center in Sunnyside Queens, serving tea to the participants of a Turkish cooking class. Another woman had served everyone a lentil and wheat pilaf, seasoned with parsley, scallions, tomato paste and pepper. I could taste the flavorful scallions and pepper, which were muted by the lentil paste and cracked wheat. The tomato paste and parsley were more for coloring and ornamentation than for flavor, as they were scarcely perceptible. She explained to me that she knew people had come from work and likely hadn't had time to eat anything. I found myself thinking about how I could easily get used to this kind hospitality; and how in American culture we’ve let slip some of the old world charms still practiced by many of the first generation immigrants. It seems to me that in our frantic pursuit of American modernity … we've thrown out some of the baby with the bathwater ... but I digress. Our teacher, chef and host this evening was Sila Asa. She’s a young Turkish mother who’s a spunky blend of Turkish and American character. She’s fluent in both languages, and like the Turkish women who assisted her, showed great knowledge of the nuances of the culture from which she came, as well as the milieu in which she now lives. In the photo to your left is Sila Asa, the chef / instructor of the Turkish cooking classes given at the Turkish Cultural Center in Queens. The first dish Sila would show us how to prepare was a Stuffed Pepper with Ground Meat. The ingredients are: 1 lb of small Italian peppers, 2/3 lb of ground beef, 1 onion chopped, 2 tomatoes chopped, 2 tbsp of tomato paste, 1/3 cup of olive oil and salt and pepper to taste. Instructions. She mixed the ingredients in a large bowl, except the tomato paste and the peppers into which the stuffing would go. Wash the peppers and cut off their tops and clean out the seeds. Stuff the peppers and place inside a large pot. Mix the tomato paste with water and fill the pot with the water and tomato paste until the water is up to about half the pepper height. Then cook for about 40 minutes atop the stove until the peppers are soft and the meat is cooked. 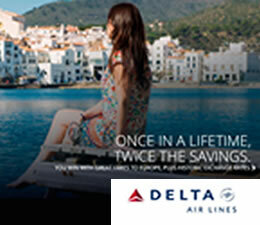 See photo slide show below. Sila had a pretty lively running commentary with the audience. About a third of the class were returning attendees, so there was some comfort and familiarity that spread throughout the room as the evening went on. Sila reminded me a bit of a talk show host, like a mix between Oprah and Cathy Lee. Part of her repartee included comments like, “I had hoped to get sick this winter, so I could lose some weight”. The audience contributed to the lively banter, sharing food experiences of their own. One member of the audience talked about how she had eaten tongue while traveling in Europe some time ago. And another woman chimed in that she’d eaten tongue too, which she thought might have contributed to her becoming a vegan. It was onto the Baked Pasta with Bechamel Sauce. The ingredients for this delight included fresh penne pasta [250 grams = 9 ounces] which had been boiling on the stove while Sila was making the Stuffed Peppers. 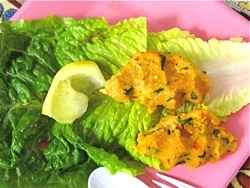 The other ingredients include: 4 tbsp of butter, ¼ cup of flour, 1 cup of milk, 2/3 cup of feta cheese crumbled, ¼ cup parsley chopped, 2/3 cup of mozzarella cheese [for garnish] and salt and pepper to taste. Instructions. They had washed the pasta and drained it before bringing it into the room. Sila then melted the butter, added the flour and stirred for about 3 to 4 minutes before adding the milk slowly into the mix. Add salt and pepper and then turn off the heat and let cool for 3 to 4 minutes. 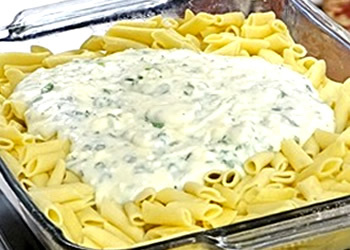 Then add the feta cheese and parsley and toss it over the pasta in an ovenproof dish. Sila liked to use pyrex glass cookware. Lastly insert it into the oven with a cover on it and bake at 400 degrees for about 30 minutes or until the top turns brown. Be careful not to overcook it. 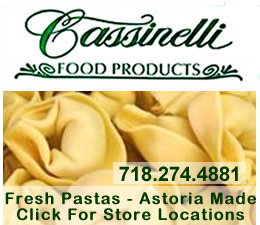 We heard tell that it’s one of the most flavorful home cooked pasta and cheese dishes that can be easily made. The banter in the room had become contagious as the audience started kibitzing with each other about all sorts of things. Sila wondered aloud if anyone was paying attention. In this age of multi-tasking, I could tell the audience was simultaneously watching Sila work, while they carried on with a number of side conversations. So onto the last dish, the Tea Biscuits with Chocolate Pudding Dessert. Sila believes in using only the best ingredients, some of which she gets from her mother-in-law who lives in Turkey. She mentioned the tomato paste as an example of something she had been sent, which doesn’t include a lot of additives. This triggered quite a running commentary from various members of the audience about finding good ingredients in a genetically modified food world, where the packaging has a long list of ingredients the likes of which only a scientist might know. 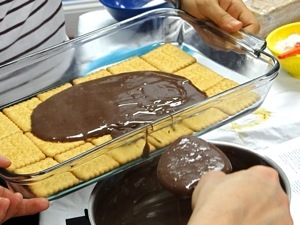 The dessert ingredients included: 2 packs of tea biscuits, 2 cups of milk, 5 tbsp of flour, 2 tbsp of cornstarch, 1 cup of sugar, 3 tbsp of cocoa and 2 tbsp of vanilla. The vanilla was a dry powder that didn’t contain alcohol. It was labeled in Turkish, but apparently made by a German company [someone recalled that the German company had purchased a Turkish supplier]. Instructions. Sila mixed all the ingredients in a pot and started whisking them into a soup-like texture before she turned on the heat. She told us it’s easier to get the ingredients to mix before they are heated, than after. Then she turned on the heat and continued whisking until the mixture became a pudding which she poured over the tea biscuits in the 9 x 13 or 3 quarts glass pan. You can build several layers with the tea biscuits, adding the pudding as you go up and you can include nuts too, but she didn’t because she knows many people have nut related allergies. And so it was. I didn’t have time to stay and enjoy the fruits of Sila’s labors, but it all looked very, very good. 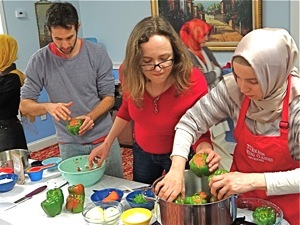 Turkish cooking classes cost $25 for a single outing; and $20 per class if you sign up for more than one class. 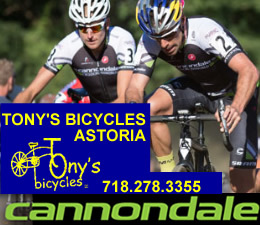 The classes are held monthly, usually on the first or second Wednesday of the month [depends on holidays and scheduling] and the season ends in June. It’s worth noting that Istanbul, Turkey was the seat of some of the greatest empires of the western world: the Eastern Roman Empire and the Ottoman Empire. Thus the Turks are well known for their cuisine which has been highly cultivated for well over a thousand years. And as they say in Turkish Afiyet Olsun [bon appetit]. 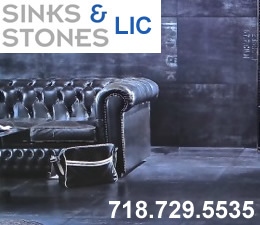 This program was sponsored by the Turkish Cultural Center in Queens, just off the corner of Queens Blvd and 45th Street in Sunnyside. 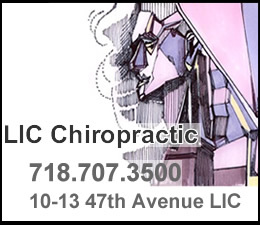 It's easy to get to via the #7 subway line - just get off at the 46th Street station and it's a two block walk. 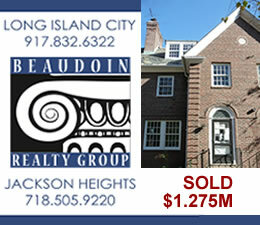 Click here for the Turkish Cultural Center business listing which includes a map and a link to their website. 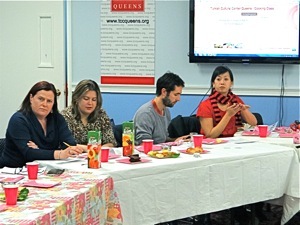 The following slide show contains photos taken at the Turkish cooking classes in Sunnyside Queens. Click here to go directly into the photo album containing photos of Turkish cooking classes in Sunnyside Queens.